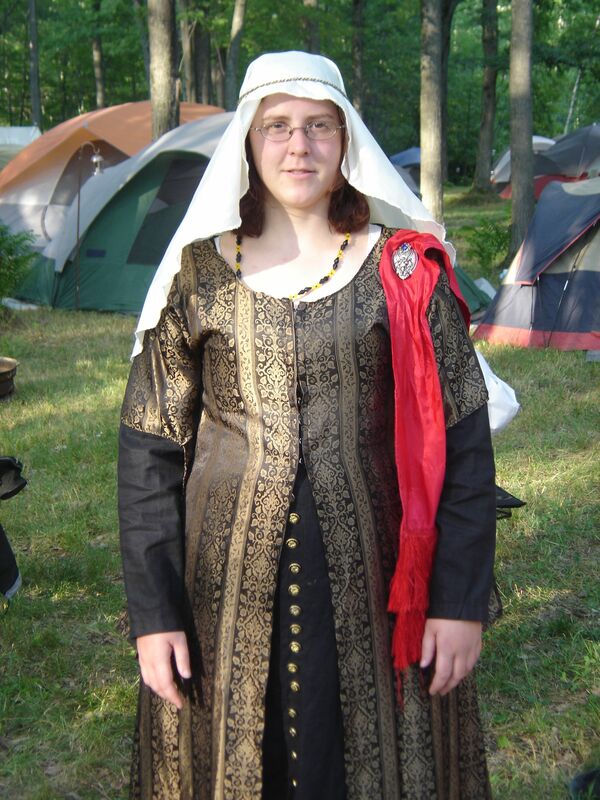 This is a collection of photos taken by me and others of the medieval "garb" I have made. Most of my work has been for my personal use, but lately I have started branching out and making clothing for others. on them multiple times throughout the process to ensure they fit! Both outfits made by me. 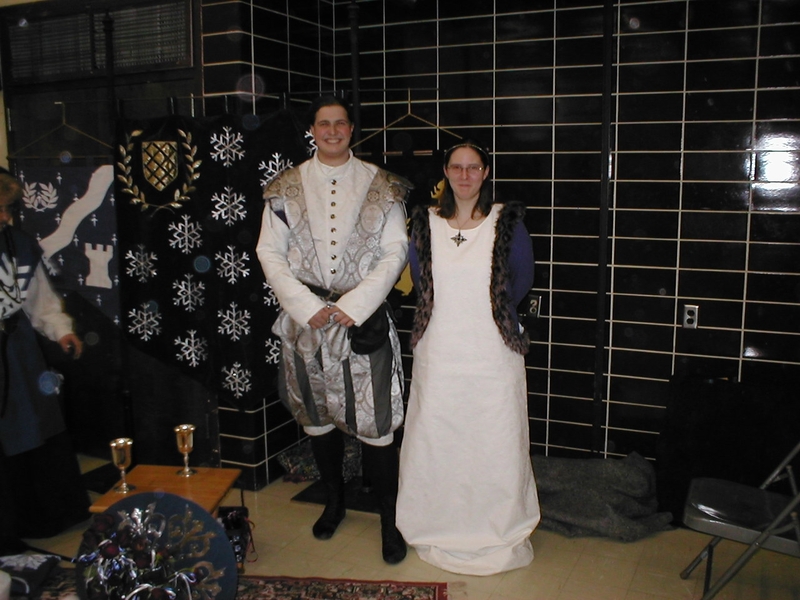 Lord Tarien Dane models an Elizabethan men's outfit on the left; I'm wearing a sideless surcoat trimmed with fur. Photo taken at "Don't Drink the Water"
Photo taken at "Arrg 2: Electric Bugaloo"
This cape accompanied the Tacky Garb for the evening, and then was gifted to Kristoff Fuegger von Augsburg upon its completion. Each of the fleur-de-lys on the cape are hand-adorned with a pearl. 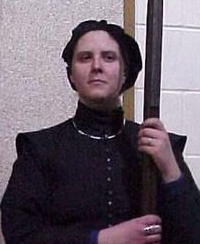 A black doublet with sleeves and matching hat. Gold embroidery is in progress on the hat. The necklace was made by HL Bronwen Arianwen. Photo taken at "Nordskogen 12th Night 2004"
This is a professional portrait of the Tudor dress. I made the headpiece by hand the night before the event. 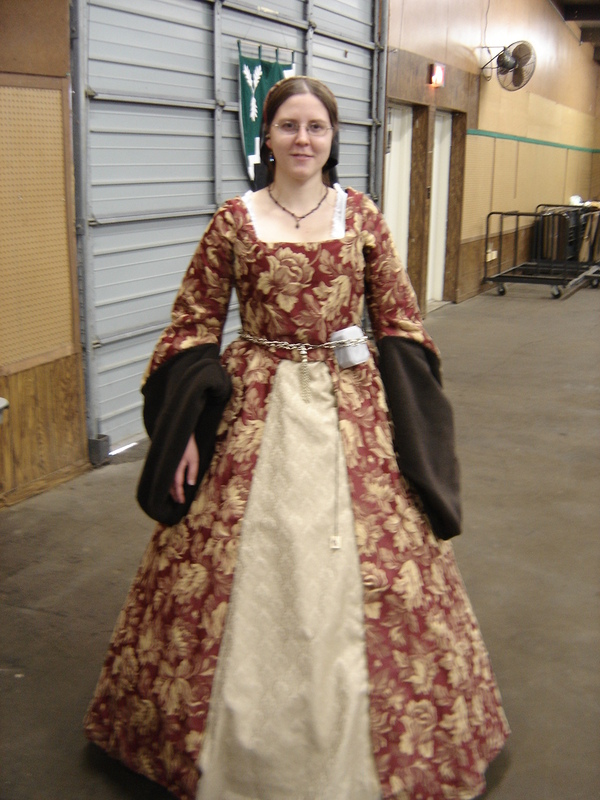 Photo taken at "Clothiers Seminar North 2004"
This is the final version of the Tudor gown. 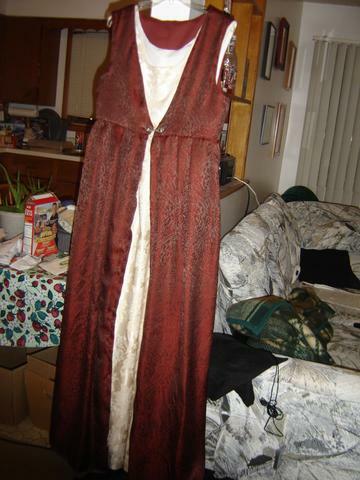 I added the fur-lined sleeves and gold chain belt, and the neckline and cuffs of the chemise have lace. 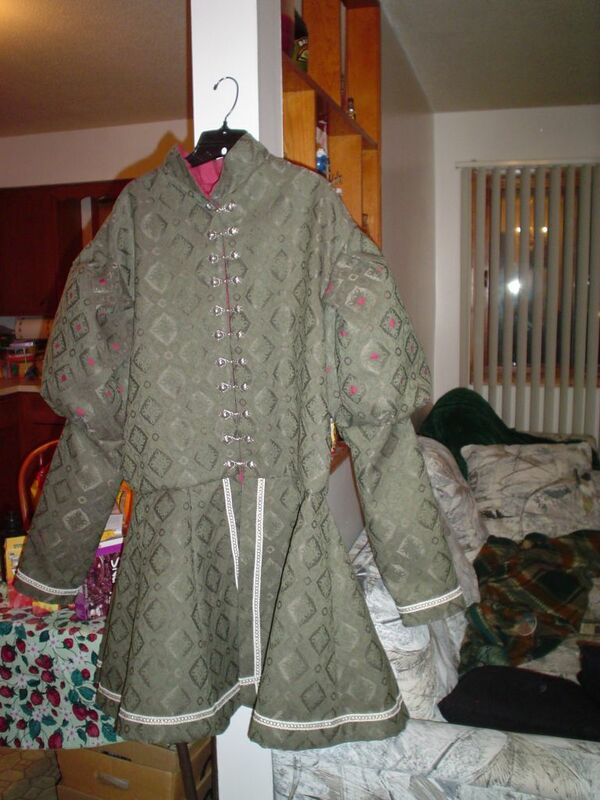 Photo taken at "Northshield's 3rd Crown Tourney"
A coat in the style of Henry Tudor. The upper sleeves are puffed and slashed to show the contrasting lining. Made as a gift for Don Senan O'Faolan. 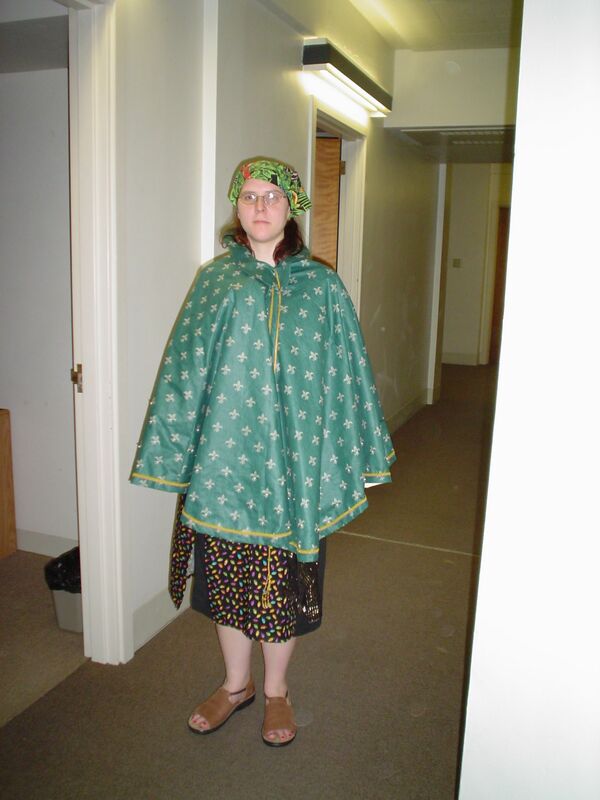 This wool-lined cloak was made for Don Lazarus Gauge as a surpise gift. This photo shows the hat/outfit combo in action. 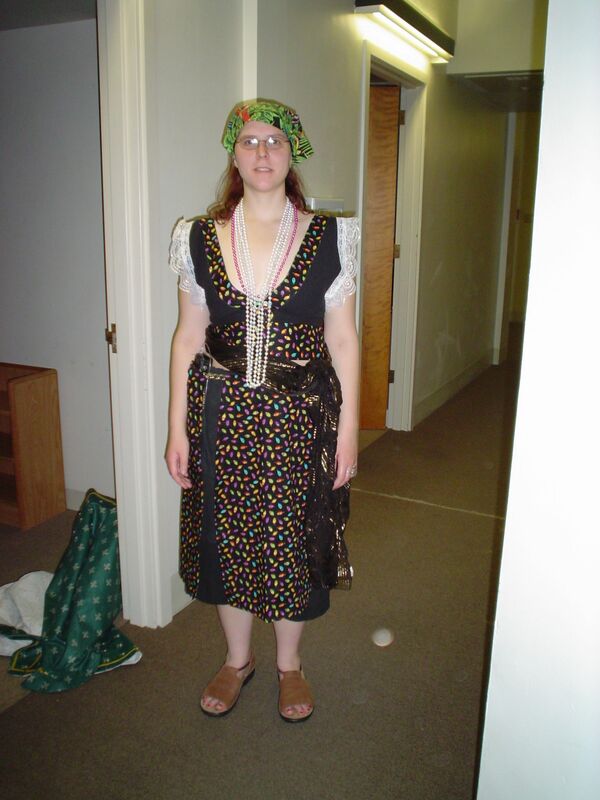 This garment is two pieces: the first is a cream-colored underdress (gamurra), an Italian fitted, side-lacing gown. 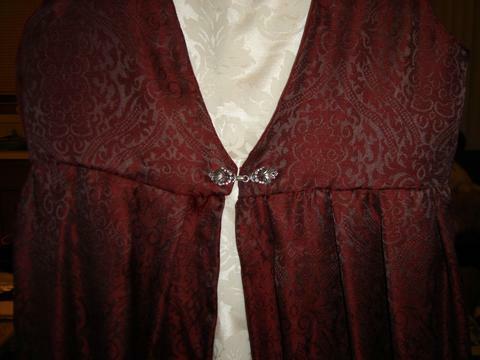 The red overdress, known as a giornea, is sewn up the sides and clasps in front. A close-up of the clasp on the giornea. 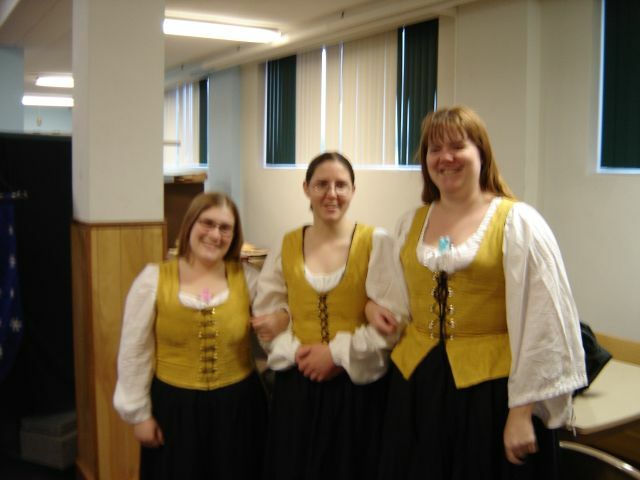 Photo taken shortly after "Gulf Wars 14"
This is an over-cotehardie with hanging sleeves and hook-and-eye closures up the front from waist to neckline. 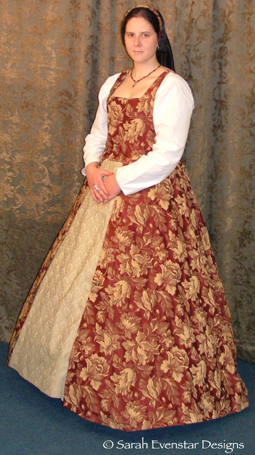 It is worn over a black linen cotehardie with buttons up the front, and an under-cote of white muslin. The necklace was a gift from Her Highness Northshield, Gwyneth Felton. 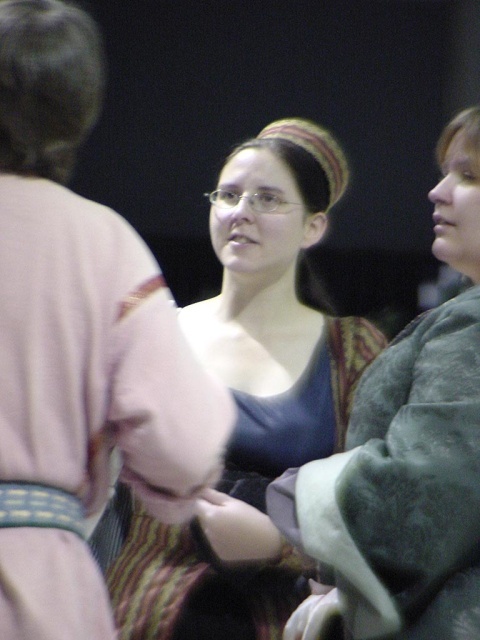 Photo taken at "Warriors and Warlords 13"